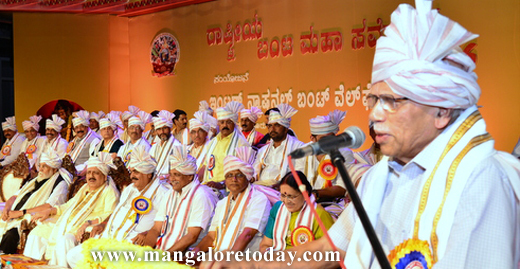 Mangaluru, Feb 8, 2016 : The Bunt community should lay due emphasis on protecting its glorious culture as well as unity. No society or community can progress if it shies away from its culture and tradition, said Dr B.M. Hegde, former vice chancellor of Manipal University. He was delivering the valedictory address of the two-day National Bunts Convention at Town Hall on February 7, Sunday under the auspices of the International Bunts Welfare Trust. Continuing, he said the Bunt community should never forget that it could reach the heights of glory due to the importance attached to Dharma, justice and ethical values. Sri Esha Vittaladasa Swamiji of Kemar Sandeepani Ashram who blessed the occasion, said the Bunt community is known for its broad minded nature. Though Tulu had its own cultural framework today culture has transcended all barriers, he said. Dr D.K. Chowta presided over the function. A Sadananda Shetty, President of International Bunts Welfare Trust, Ramanatha Rai, DK District in-charge Minister, Abhayachandra Jain, Minister for Sports and Youth Services, JR Lobo, Moidin Bava, MLAs, Jacintha Vijay Alfred, Mayor, Ibrahim Kodijal, MUDA Chairman, Amarnath Shetty, former minister, M Mohan Alva, Chairman of Alva’s Foundation, noted singer, music director Gurukiran and others were present. Resolutions passed : The Convention resolved to urge the government to include the Bunt community in the OBC category and also to extend to them reservation in education and jobs on the grounds that they are language minorities. Another resolution passed was to urge the government to keep Bhootharadhane, Nagaradhane and Yaksharadhane outside the purview of the proposed anti-superstition Bill.